This has been a whirlwind weekend. So many stories, like the car breaking down on the way to Danville and having to turn back to have the car checked out. Long story short, we arrived at the Historic North Theatre in Danville VA shortly after midnight on Friday. 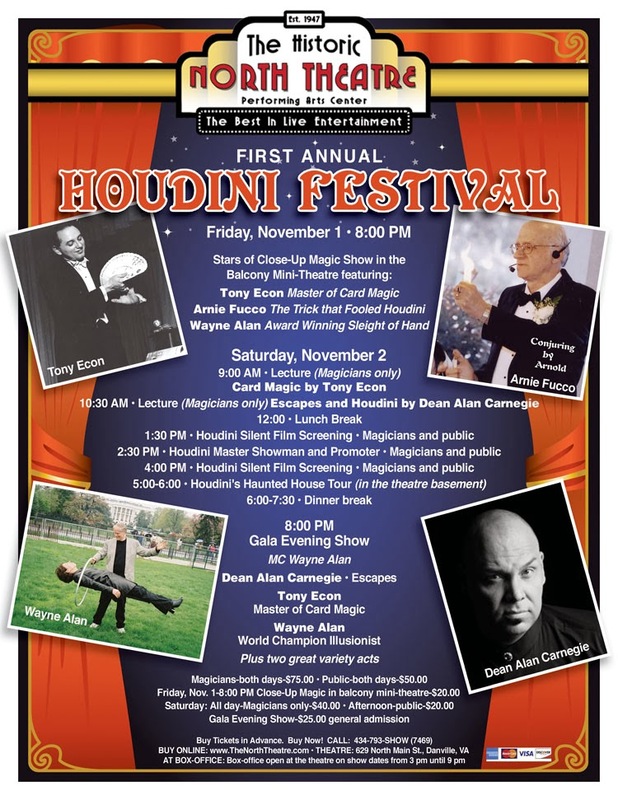 Magician Wayne Alan owns the theatre where the Houdini Festival takes place. Attached to the theatre is a bed and breakfast which is just amazing. I'm not sure how many rooms there are, but Wayne has turned them into themed rooms. Of the ones I can remember, he has the Marylin Monroe Room, the Sinatra Room, the Tonight Show Room, the Today Show room and there are others I've forgotten. You can access the theatre from the Bed and Breakfast which was great. First thing, Saturday morning Wayne gave us a tour of the Theatre. Let me say, this place is a real treasure. At one time, Danville VA sported 5 Vaudeville Theatres. 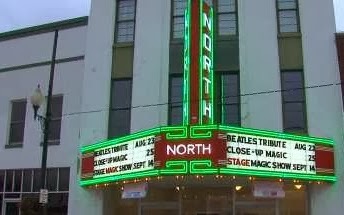 Today, the Historic North Theatre is the only one which remains. It was recently refurbished before Wayne purchased it, so it has brand new seats (500 of them) and really a brand new everything. It's an amazing place. In the basement below the stage, Wayne has put in what he calls Houdini's Haunted House. It's a normal Haunted House with some rather interesting Houdini artifacts scattered throughout. He also keeps several of the side show style illusions down there. It's certainly clever and word was he did a really strong business over the weeks in October because of Halloween. I will write about some of the artifacts in a future blog this week. In the balcony of the theatre, Wayne Alan has created a sort of mini-theatre and this is where the lectures took place. The first lecturer of the event was Tony Econ. Tony is a fantastic card magician with a truly amazing life story. He was a great guy and did a simply fantastic job with his lecture. Next up was ME! I was doing my lecture on Houdini and Escapes. To be specific, it's more on escapes and only briefly covers Houdini. 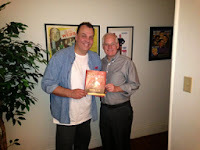 The reason is because you can't talk escapes without mentioning Houdini. I talked a bit about the history of escapes and then taught a number of rope escapes, thumb cuff and thumb screw escapes and finally gave them some very clever information on handcuff escapes. I finished by performing an escape called The Strong Box. I was really thrilled with the reaction to my lecture and the response that followed. I'll be presenting this lecture again in the future. After my lecture we had a surprise guest. But I'm going to hold the information on this wonderful lady because I need to get some photos and more biographical information. So this part of the day is for a future article. Wayne gave some really wonderful examples to back up his thoughts on Houdini's success and I'd say he was pretty much right on the money. some of the activities in the afternoon. Basically, we had to get to the store to buy a video tape to record the evening Gala Show. Once we returned, the evening was spent preparing for the show, loading in our props and getting on costumes. 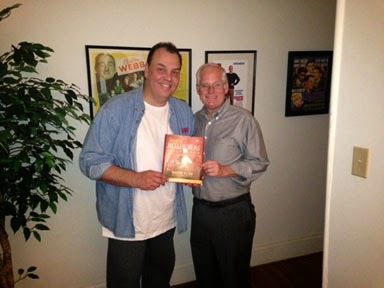 I should mention that Wayne Alan acted as M.C.for the Gala Show. He said a few opening words, did a quick routine and then proceeded to introduce the first act. Up first was Tony Econ doing his wonderfully executed Manipulation Act. Tony was great during the day with his lecture and he proved equally strong performing Card Manipulations and Billiard Ball moves with Large Dice. Next up was Denise and I presenting our Steampunk Illusionist Act. During the course of the act we actually presented one escape routine and closed with my signature story trick about Houdini and Charlie Chaplin. Wayne wrapped up the last part of the show by presenting the Misers Dream, A clever Shrinking Illusion using someone from the audience and then Floating a Member of the Audience in the Air. The audience loved the show! We got to meet and talk with them in the lobby following the performance. After the last person exited the theatre, the boring part of showbiz began, which is tearing down the props and loading them in the car. Then stripping off all the costumes and makeup and getting ready to hit the road again. Another thing I missed was the Friday evening Close-Up Show in the Mini-Theatre. I forgot to ask Wayne how this part of the event went over, but I'm sure it went fine. The First Annual Houdini Festival was fun. The number of attendees was less than Wayne would have liked but it just meant that it was more of an intimate gathering. For all who attended, they got a real treat with some bonuses that I have not mentioned. 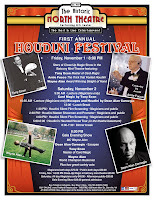 Wayne Alan is already beginning work on The Second Annual Houdini Festival. I know he is looking for lecturers, speakers, performers and of course attendees. Wayne has some Houdini related artifacts that he told me about which would make any Houdini-fan very envious and I'm sure they will show up in future editions of this festival. There are already some really cool things planned for next year so it's going to be something I personally will be looking forward too!